SOURCE: Winmax Trading Group, Inc.
NEW YORK, NY--(Marketwire - May 2, 2008) - bnetTV.com, Inc. (www.bnettv.com), a subsidiary of Winmax Trading Group, Inc. (Winmax) (PINKSHEETS: WNMX), announced today a partnership with the Mobile Marketing Association (MMA). bnetTV.com is now an official Internet Broadcast Media Partner to the Mobile Marketing Association's North America Mobile Marketing Forum (www.mobilemarketingforum.com) event series. "The Mobile Marketing Forum has emerged as the world's leading event for mobile marketing," said Laura Marriott, president of the MMA. "bnetTV has been a strong supporter of the events to date and we look forward to working with them, as an Internet media broadcast sponsor, to offer our delegates the ability to see video footage directly from the show." The MMA is the premier association for the Mobile Marketing industry. As a global non-profit industry trade association the key mission of the MMA is to stimulate the growth of mobile marketing through guidelines, best practices and education for those engaged in mobile marketing. Over the past few years the organization has grown exponentially to over 600 members. This has become a testament to the industry's commitment to creating a sustainable mobile channel to encourage consumer adoption and brand participation. The Mobile Marketing Forum provides the opportunity for those new to mobile to learn how to engage the mobile channel -- and those already engaged in mobile to learn how to deploy more advanced capabilities to enhance existing initiatives. The Mobile Marketing Forum brings together industry leaders and experts from around the globe to share their expertise on how to leverage this hot new media channel. Each Mobile Marketing Forum highlights the key topics in the mobile marketing industry, presented by our industry's leaders and innovators. bnetTV.com will be the official Internet Media broadcaster for the MMA's flagship event the Mobile Marketing Forum taking place this summer at the Marriott Hotel in New York, June 10-11. Our "on-the-ground" reporting teams will be speaking with industry leaders and reporting on the key issues pervasive within mobile marketing and highlighting the initiatives that association members will be implementing. Michelle Sklar, Producer for bnetTV.com, says, "We are not only excited to be partnered with the MMA, but as the lead Internet Media broadcaster for this year's Mobile Marketing Forum, we are in for an exciting opportunity to speak with high-level executives within the mobile marketing industry, and in particular, report on some of the innovative ways brands are engaging with consumers." To view coverage from previous Mobile Marketing Forums, visit www.bnettv.com. With over 2.6 billion mobile devices worldwide, mobile is positioned to become the most widely used media outlet globally. As more and more brands learn to optimize the opportunity to engage consumers through the mobile channel the advertising paradigm will continue to shift. Limbo's Mobile Advertising Report, released in March 2008, showed that over the three months the number of people in the US who recall seeing an ad on their mobile device "has increased significantly from 78 million to 82 million" and that the "most significant areas of growth occurred among women and those aged 25-34." The report also stated that "the most commonly recalled brands were the mobile carriers themselves, most notably Verizon and AT&T, followed by mobile service providers (ringtones, games, music, dating) and handset manufactures." TotalWeb, the first cross-platform Internet measurement service, launched by the Nielsen Company, reported that the Mobile Internet has extended the reach of leading Internet sites by 13% mm. Jeff Herrmann, Vice President of Mobile Media, Nielsen Mobile, stated, "The data demonstrates that the mobile Internet can not only increase the frequency of visits to a website, but also grow the overall size of the pie." He continued to say, "Publishers can now monetize their total cross-platform audience, and advertisers will better understand the efficiency and incremental value of mobile Web traffic." 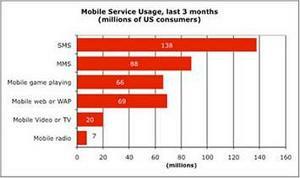 Nielsen Report on Mobile. bnetTV.com is a wholly owned subsidiary of Winmax Trading Group, Inc. (PINKSHEETS: WNMX) with offices in New York, NY, San Jose, California, Orlando, Florida and Calgary, Alberta. This release contains "forward looking statements" within the meaning of Section 27A of the Securities Act of 1933 and Section 21B of the Securities Exchange Act of 1934. Such forward-looking statements involve known and unknown risks, uncertainties and other factors that could cause the actual financial or operating results of Winmax Trading Group, Inc. and its subsidiaries, including bnetTV, Inc. (hereafter collectively referred to as "the Company," "we," "our" or "us") to be materially different from the historical results or from any future results expressed or implied by such forward-looking statements. The words or phrases "would be," "may allow," "intends to," "may likely," "are expected to," "may continue," "is anticipated," "estimate," "project," or similar expressions are intended to identify "forward-looking statements." Such statements include those concerning our expected financial performance, our corporate strategy and operational plans. Actual results could differ materially from those projected in the forward-looking statements as a result of a number of risks and uncertainties, including: (a) intense competition in the webcasting, online media, web development design, Internet solutions, e-commerce, and retail business; (b) whether we are able to manage our planned growth efficiently, including whether our management will be able to identify, hire, train, retain, motivate, and manage required personnel or that management will be able to manage and exploit existing and potential market opportunities successfully; (c) whether we are able to generate sufficient revenues or obtain financing to sustain and grow our operations. bnetTV, Inc is a wholly owned subsidiary of Winmax Trading Group, Inc. bnetTV's agreements and event coverage should not be construed by any means whatsoever as having any impact on or a reflection of the Company's future stock price or future financial results. About this company Winmax Trading Group, Inc.
Laura Marriott, President of the Mobile Marketing Association talks with Michelle about the CTIA show and some of the issues in mobile marketing.